Ehrenreich, Glover, and Lucasfilm give us the 'Solo' origin we deserve while putting a definitive stamp on an age old Solo debate. Made for anyone willing to give it a shot. The deck was stacked against Solo: A Star Wars Story from conception. As if it’s not a bold move for anyone to be making a prequel to the original Star Wars trilogy, they sought to take us back to the yesteryears of the beloved Han Solo. So it’s a good thing Lucasfilm is handling it themselves. Even better, having Kathleen Kennedy made sure to play her cards right, ensuring maximum quality. While Kennedy may have given Rian Johnson free reign to polarize the entire franchise with The Last Jedi, she swiftly replaced original Solo directors Phil Lord and Christopher Miller with Ron Howard. While we may never know what could have been — word was that they were trying to make a buddy comedy 21 Jump Street style — but Howard was definitely a better fit and Solo beats the odds so don’t ever tell him the odds. Han (Alden Ehrenreich) is on the run with Qi’ra (Emilia Clarke) from a local gang on Correllia. The two are separated with Han joining the Imperial Navy to become the best pilot in the galaxy. Three years later, Han meets up with criminals Tobias (Woody Harrelson) and Val Beckett (Thandie Newton), and Rio Durant (voiced by Jon Favreau) while meet-cuting Chewbacca (Joonas Suotamo). Now, everyone needs the help of Lando Calrissian (Donald Glover) to steal unprocessed coaxium from the Kessel mines for Dryden Vos (Paul Bettany), the leader of the Crimson Dawn criminal syndicate. All while the Cloud Riders are hot on their tails! With The Force Awakens, Rogue One, and The Last Jedi, it’s nice to find Solo setting out to not try its damnedest to fit in. This is Solo’s movie through and through. Never getting bogged with political agendas, Howard has crafted this outing back to the feel of George Lucas’s original trilogy. Of course there’s plenty of CGI, but this is also the dirtiest of the new films. Dirty as in Solo’s world has a lived-in quality, it’s not bright and shiny. That being said, be careful where you see it, the first press screening felt a little too dark and my suspicions were proved correct after the second one was held on an IMAX screen. It looked better and was far more enjoyable in round two. I mean, it is a Star Wars movie so why wouldn’t you see it on IMAX anyway? Howard’s overhaul also brought in his years of expertise. This is his best film since Apollo 13 and hopefully reignites his spark from the ’80s and ’90s. Master Star Wars scripter Lawrence Kasdan (The Empire Strikes Back, Return of the Jedi, The Force Awakens) — along with son Jonathan — send us back to before the rebellion and make sure the audience is taken on a breathtaking rollercoaster ride. They also take time to plant the seed for future adventures and even more spin-offs. And then there’s the cast. The RottenTomatoes score keeps falling and it’s obviously ruined by those who just can’t see Han portrayed by anyone other than Harrison Ford. Ehrenreich is one of very few who could pull it off. He’s spectacular from first frame to last and has truly become (young) Solo. And then there’s the always impressive Donald Glover. No one since Billy Dee Williams was born to play Lando and now no one else can. As much as everyone is clamoring for Lando to get his own film — myself included — it sounds like Kennedy is in no rush. And as Lando himself may say, that’s nothing but a good thing, baby. 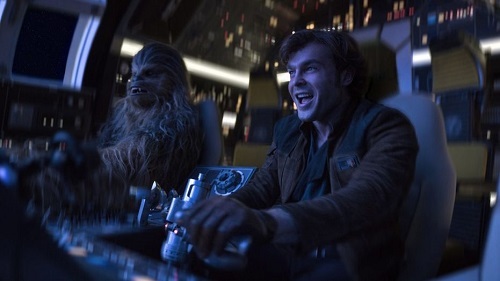 And of course, Chewie steals every scene he’s in. Solo: A Star Wars Story isn’t perfect. Considering its troubled production, it’s a miracle Solo is as good as it is! Filled with old friends and new faces, it’s a fun Star Wars films and an admirable addition to the franchise.